Do you have ancestry in the NSW public service? 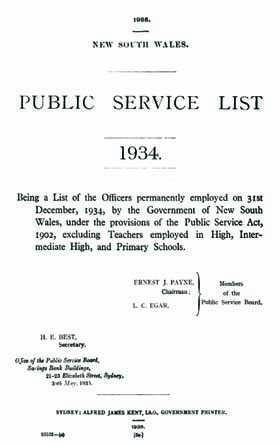 If so, make sure you check this list of over 6000 officers permanently employed on 31 December 1934 by the Government of New South Wales (excluding teachers employed in High, Intermediate High, and Primary Schools). It's a great genealogy tool for anyone building a family tree.